Since the moment it was first projected on the movie screen earlier this year, "Memento" has made the kind of impact on audiences that hasn't been seen since "American Beauty" or "Pulp Fiction," the kind that leaves viewers in a situation so filled with new ideas and reasoning, instantaneous discussions are provoked. Admittedly, I was not part of this initial discovery; somehow, someway, I allowed the film to simply float over my head, never even seeing it until just recently on DVD. Now that there has been a chance for me to catch up on the phenomenon, I long to immerse myself in those rich discussions with close friends, who have seen the picture perhaps countless times by now and yet still find so much to talk about regarding it. 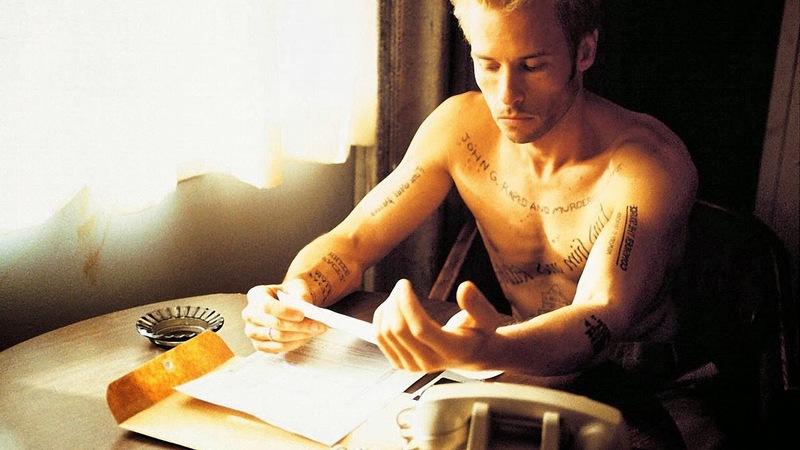 And they have good reason to; whereas the majority of theatrical releases in 2001 were so bland that they practically blended together, a film like "Memento" stands out, dares to challenge the common style, and ultimately gives birth to a new mold of storytelling. It is the jackhammer for our frozen imaginations. In my reviews from earlier in the year, I ceaselessly commented about how few, if any, movies in the current cinematic climate actually deserve undivided attention from moviegoers; at the time I even referred to "Blow," a rather average film, as one of most respectable of the year. It wouldn't be hard, then, to imagine how drastically different those comments would come across had I actually seen "Memento" at the time. The film stars Guy Pearce as Leonard Shelby, a former insurance representative whose wife was raped and killed just down the hall from where he was sleeping. Because of the failure of the FBI to find those responsible, his life now consists of nothing but trying to avenge the death of his significant other. But to complicate matters, Leonard has short-term memory, which makes it impossible to for him to generate memories past the point when his wife died. As such, he utilizes his time collecting evidence via tattoos and Polaroids with captions, storing all the crucial facts in a way that would allow him to continue his investigation despite his inability to retain the information mentally. Helping him in his quest are Natalie (Carrie-Anne Moss), a waitress at the local bar whom, as we see via one of Leonard's captions, has "lost someone and will help out of pity," and Teddy (Joe Pantoliano), a man who claims to be a close friend to Shelby but is probably hiding something or simply lying about his identity. The movie operates in a manner that reveals little details to us a piece at a time, almost as if the filmmakers want us to treat it like a giant jigsaw puzzle. The big difference here, however, is that we're trying to assemble it without the edges; in the reality that Leonard has become trapped in, nothing is certain and nothing precise. It's impossible for either side to see where this journey is heading, if the majority of his collected "facts" are simply misconceptions brought on by his disorder or manipulated by outside forces, who freely use his problem to their self-fulfilling advantage. Can we even be sure that Leonard kills the right man? Better yet, how can he even be sure? 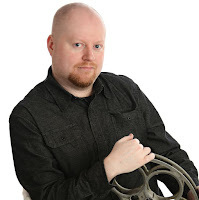 It should be noted that the concept I have just described is brought on not by the plot itself (which is relatively simple), but the technique it is told in. We see the movie completely in reverse; the last technical scene of the story occurs in the opening moments of the film, and the beginning of the plot, likewise, isn't seen until the very close of the picture. The approach is not simply unique, but in an ironic twist, ultimately necessary given where the elements of storytelling are placed. The precise start of the events contains the elements of a climax that provide us with the most jolts, while the actual resolution is relatively subtle and reserved. Had the story been told straightforwardly, the plot would seem overly simple and the movie would have lost its compelling, investigative edge. Some audiences felt frustrated by the process, but with two or three extra viewings, it's not too hard to comprehend... unless, of course, you have short-term memory yourself.